English Daisy White Bellis Perennis Super Enorma is a double flowering, aster-like variety. 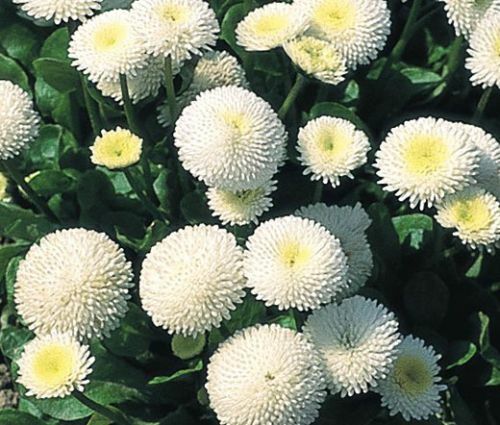 English Daisy seeds germinate in 2-3 weeks without any special treatment, and this particular Bellis Perennis plant produces large, fully-double, white flowers and features compact, low to the ground, rosette-like, dark-green foliage. The blooming English Daisy flowers are very showy, and the plant blooms heavily all spring long providing an excellent display of white color and attracting bees and butterflies. English Daisy White is often grown as a ground cover and looks great when planted along with other rock garden plants. English Daisy is a delightful addition to spring bulbs and is good for containers, window boxes, or hanging baskets. Bellis Perennis seeds have to be just lightly pressed into soil, and the established English Daisy grows best in full sun or partial shade but adapts to less than perfect growing conditions including dry soil, but this plant does not tolerate heat and humidity. English Daisy is perennial in cooler zones, but everywhere else the plant is grown as biennial.